Beowulf - Beowulf is the oldest surviving work of literature in the English language (Old English of course). It's authorship has been lost to history but, based on the language, was written by an Anglo-Saxon poet probably sometime in the eighth century. It chronicles the adventures of a Scandinavian hero, Beowulf of the Geats, who battles three great beasts. The Geats were a northern Germanic tribe which occupied the southern portion of modern-day Sweden. He visits Hrothgar, king of the Danes, after learning that the king's great hall is being terrorized by a creature named Grendal. Beowulf battles Grendal and defeats him. The monster runs off into the darkness to die. That night, Hrothgar holds a feast in his hall to celebrate Beowulf's victory over Grendal. However, after the feast has ended, Grendal's mother (no proper name given) shows up seeking retribution. She kills Hrothgar's most trusted warrior, Æschere. So Hrothgar, Beowulf and their men set out to hunt down the beast, and track her to her lair. There, Beowulf is given a sword named Hrunting by one of Hrothgar's men, Unferth. He enters the lair alone (no reason given other than that he is the hero of the story) to do battle with Grendal's mother. Inside, he finds Grendal, nearly dead, as well as the remains of many men killed by the two monsters. There is also a hoard of treasure. Beowulf fights Grendal's mother and is nearly defeated, but is saved by his armor. 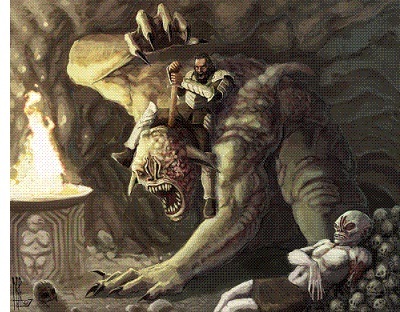 Hrunting appears to do no damage to the creature, so he discards it and pulls a sword from among the treasure. It turns out to be a magic sword and, with it, he slays Grendal's mother. Beowulf returns to Hrothgar in triumph, and Hrothgar presents him with yet another sword, Nægling. After these events, the story jumps ahead 50 years and Beowulf is now an elderly man, and king of the Geats. The land is attacked by a dragon, after one of his men takes a golden goblet from the dragon's lair. Beowulf and his men march out to defend their kingdom, but once there, Beowulf, armed with Nægling, tells them he will fight the dragon alone. He is outmatched, however, and one of his men, Wiglaf, races to his aid. 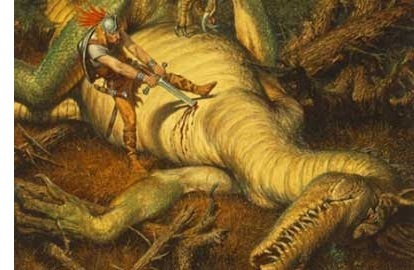 The two of them defeat the dragon, but Beowulf is mortally wounded. He dies and is buried on a cliff by the sea in Geatland, where sailors can look upon his burial mound as they pass by in their ships. It's rather remarkable that the story of Beowulf has survived at all. For centuries, a single copy of the epic poem existed in what is known as the Nowell Codex, which dates from around the year 1000. And that copy was damaged (nearly destroyed) in a fire in 1731. Having survived the fire, though, it was finally published in 1815 in its entirety. However, it didn't enjoy much popularity until English literature & language professor, and author, J.R.R. Tolkien, wrote an impassioned defense of the poem he presented in a lecture in 1936. The reason he did was due to the fact that Beowulf had been largely dismissed as a credible source of Anglo-Saxon history by contemporary scholars due to its mythical elements. Since then, it has been embraced by academia and the wider public as a whole.